For everyday use Ubuntu works in a similar way to a windows PC. It just takes a little getting used to. I use the Unity interface so this article will focus on that. However there are various others. Another time we should look at Lubuntu because it’s brilliant for bringing old PCs back from the dead!! The best way to try Unity is from a USB or CD – Put it in reboot and click Try Ubuntu. One thing you may notice is that flash may not be installed from the get go. Sites like Youtube won’t work out the box. The solution however is quite simple. Assuming you are using the Firefox web browser head over to the shopping back on your Unity bar. Left of the screen. 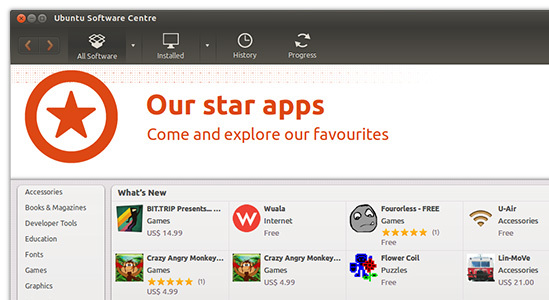 This is the Ubuntu software center. The best way to describe it is to compare it to say the Google Play app Store on Android. Search for the term flash or Flash Plug in. You should find the correct extension. Now click on it and click install. Give the machine you’re administrator password and restart your browser. In my experience (done this on a few machines) youtube and other flash based sites should now play. Chrome or Chromium don’t seem to need this additional step. Personally though I prefer Firefox. That’s going to do it for now.